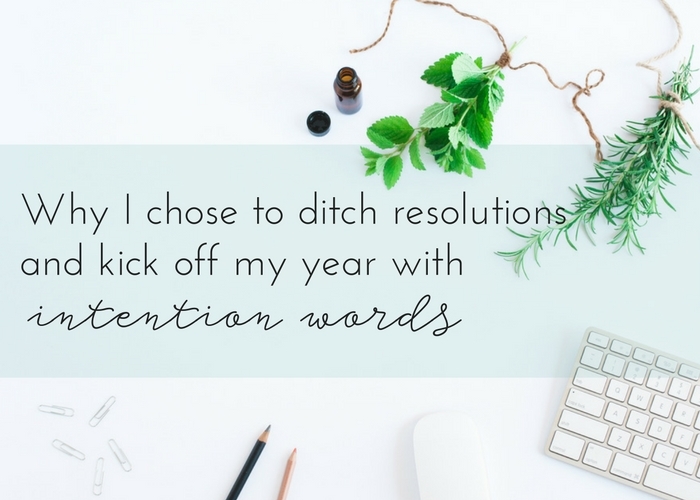 Intention words trump new year's resolutions every time! Over the last few days, my body has grossly been communicating with me in ways that literally stopped me in my tracks. From tension headaches, to making sure I stayed in bed most of the day and just yesterday, on the eve of the new year, my feet all of a sudden have swollen up. At first I thought water retention and I’m just not hydrating enough. It’s been quite hot in Melbourne this summer solstice and maybe I wasn’t taking care of my water intake enough. But I’m also recognising that this is something at an emotional level too trying to get out of me. I need to honour that. So I am reading a lot of verses from my religious scriptures and doing some energy clearing in my space. 2016 was quite the heavy year energetically-speaking. It was a year of tragedy (Aleppo, mass killings and terrorism) and also a year of exiting (bye bye Obama hello Trump; Brexit to name a few). It is the end of a 9-year cycle which began in 2008 and now the major theme is completion as we enter the new 9-year cycle with 2017 being Chapter One. I’ve never really been into numerology but numbers have a huge significance in our lives whether we tune into them or not. I believe they carry vibrational energy and we are human beings that are always resonating at some vibrational frequency. This is why I love essential oils so much because they hold high energetic frequencies and they are able to raise our vibrational energy when we are vibrating at low energies due to our negative emotions and feelings caused by our thoughts and limiting beliefs. When life coaches tell us they will help us become the best version of ourselves, really what they’re saying is they will help us vibrate at a higher level so that we can truly begin to shine and get unstuck from our limiting beliefs. Essential oils do the same thing which is why the Emotions Library can help you discover which essential oils to use to begin raising your vibration as you anchor new behaviour with the positive emotion you’d like to feel or to eliminate the negative emotion you’re experiencing. Now let’s take a good look at new year’s resolutions and why they don’t help in raising your vibrational energy. I used to set New Year’s resolutions every year and they usually sounded like this: Lose Weight, Get Closer to God, Spend More Time with Family, Be More Organised and Read More Books. I don’t know about you but this type of “To Do List” approach to life does very little to inspire me anymore. Not to mention the success rates were pretty depressing. The average New Year’s Resolution never addresses the BE level which is the core issue. The best way to create positive change in your life is to BE the change you want to see. When you begin changing the BE level, then the DO level will follow more easily and you’ll have whatever you set out to BE from the beginning. Want to feel happier in 2017? Resolve to BE happier in 2017. Want to have a better marriage? Resolve to BE the type of partner you wish to see in your better half. Want to lose weight in 2017? Resolve to LOVE your body whatever its shape or size. The weight will slowly and eventually shed when your body witnesses you loving it more. And you sure as heck can’t cheat your body from the love it deserves. It will know if you’re faking it and hold on to that weight like life depended on it (literally). I’m still working on this one, it’s my biggest challenge. This year will be the first year where I set my intention loud and clear with actual words that I consciously choose and speak out loud to God (or the Universe). This comes very close to a practice in my faith called du’ā (“the plea” or “the supplication”). In my faith, this type of intention-setting is actually a form of worship. Some call it manifesting. Whatever way you choose to describe it, it’s essentially the same thing. It is a plea or desire arising from the core of your heart and then it comes forward onto your lips in the form of words and it’s directed towards a very specific entity, in my world that’s God and only God because He is the Hearer of all things, the Knower of all secrets. This intention or plea is almost like a confession emanating from my heart because I know that I cannot achieve anything without God’s help and aid and also the strength to take the actions necessary to move towards my fate which I can change as I keep setting intentions and manifesting and asking for help. This type of goal-setting is way more powerful than a resolution and it’s an implicit affirmation that we have a Creator and he is the Controller of Affairs, the Hearer, the Seer, the Merciful, the Great, the All-Powerful, the Ever-Capable. These words I would choose are what will guide me then throughout the year. They will be my touchstone and my daily reminder to always live my life at the BE level. Notice I said that you still need to take action and perform the necessary tasks to move towards your destined fate or your desired outcome. I choose to act from the BEING level not from the DOING level. I am really looking forward to seeing how this new practice will change my business and personal life. I am pretty excited by it! Get quiet over the next few days and really become present with yourself and attuned to your physical being. Does anything hurt or give you pain? Do you react to anything in particular? Does a certain person or conversation rile you up, make you upset or sad or react? Your word might be along the lines of Self-Love or Truth or Growth or Awareness. Do you tend to cling to things, hoard objects and generally live in chaos thinking it’s organised chaos and isn’t that bad? Maybe your word should be Release because you’re scared of letting go of things and this word will inspire you way more than “get organised or de-clutter my house”. Now every time you catch yourself living in your clutter you will whisper the word “release” or look at it on your vision board and recall your intention to release and let go. You will realise that holding on to things is affecting your health and your diet, possibly the reason why you have that extra weight. I’ve grouped my words into doublets. I really enjoyed coming up with these and even more so the essential oils that I will make a staple throughout the year to help me anchor these words into my psyche and create new lifelong habits. I choose to awaken my senses this year and awaken to the truth of the world we live in and my own truth. I choose to practice self-awareness every step of the way and focus on my strengths. I choose fulfilment over achievement. I choose to release all qualms about my body. All hate directed at my body and all self-judgment that I am not good enough. I choose to release negative emotions quickly and promptly while acknowledging and honouring their presence but letting them go respectfully and with ease. I choose to be minimal and not hoard or hold on to objects and things and even people! I choose to let it go. I choose to let it go. I choose to release. Instead I choose to focus on life experiences and memories and being present in those moments. What are your words? I would love to know! Please share in the comments below or your experience with previous years’ words! Need help finding your 2017 words? I’ve compiled a list for you! Download my FREE resource guide outlining 30 intention words and their intention phrases and actions to help inspire you to come up with your words for this year. *Have you been waiting for a good reason to start a new website, brand yourself or any other digital marketing project? Well, here is a GOOD one! My lovely friends at Project Square Brackets, the people behind the design and development of my website are offering any of my friends a 15% off ANY project you start with them. If this interests you or know someone it would, click HERE or on the image to claim this offer. What amazing work Heba , Thank You so much for sharing ! Life is so beautiful and in my latter years , I have come to realize it truly is the journey ( with its ups and downs) that brings us to a place of AWARENESS! I am new to the ‘word of the year” concept, and I think I find it more fulfilling than a list of “resolutions” that last a month or less!! I found your website through your article in Ramadan Legacy website. I’ve been stuck in a rut for so long not achieving what I wanted due to many factors (procrastination, being a disorganised person, lack of motivation etc). These are 4 words I chose to, InsyaAllah, help me to improve myself. Strong – I am a runner and it’s very important to have a strong body. Thinking about the word ‘Strong’ makes me searching for recipes,food and strength workout that will help me getting strong. I realised these may result in losing weight as well. It is liberating not thinking about losing weight as my main priority anymore. Neat and Simple – My bedroom is a disaster zone! I try everything to make it looks beautiful. Then I realised that I don’t want it to BE beautiful because it takes a lot of hard work and money. I just wanted it to BE Neat and Simple. I also make decision/be organised using these 2 words. Try – I am so lazy and it has impacted my self-esteem. I plan to use the word ‘Try’ to persuade me to focus and get any job done. I pray and leave it to Allah to facilitate me to achieve this year fulfillment :). Thank you very much for this article.